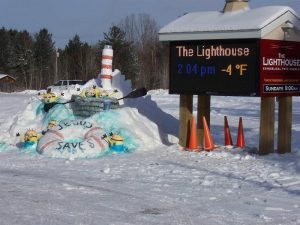 Back to Hack celebrates winter with activities including Frostbite Your Fanny 5K Race, Paul Bunyan Family Fishing Contest, Penguin Plunge, Snow Sculpting Contest, Community Bonfire and Fireworks. Returning this year will be Horse Racing, Silent Auction & Sleigh of Spirits Raffle. Come join the winter fun!